April 30 is National Oatmeal Cookie Day. Crispy or chewy oatmeal cookies are perfect with the glass of milk, and make the perfect pair to celebrate this holiday. Oatmeal cookies are considered healthier than regular cookies. But even this doesn't stop them from lasting one or maybe two days. Oatmeal cookies, like any other, can be customized to you taste. You can add raisins, nuts or chocolate chips or do not use any of these ingredients. Well, anyway, who doesn't like chocolate chips in their cookies? It is believed that oatmeal cookies appeared in the 1800s and they were created after oatmeal cakes, eaten by soldiers. Savory oatmeal cakes were great for a quick boost of energy during battle. Today we don't need to fight, but can enjoy sweet oatmeal cookies. The first recorded oatmeal cookies recipe dates back to 1896, when it was written by Fannie Merrit Farmer. 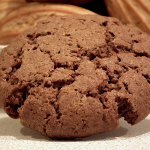 The cookies were considered as the healthier version of regular cookies, that is why they became very popular in the beginning of the 1900s and they are still even today. Bake your favorite oatmeal cookies to celebrate National Oatmeal Cookies Day!